Donald Trump No! 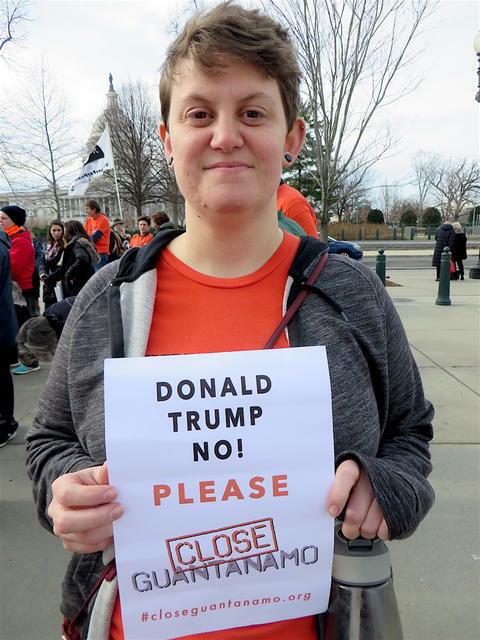 photos - Welcome to "Close Guantánamo"
Photos of some of those urging Donald Trump to close Guantánamo throughout 2017. 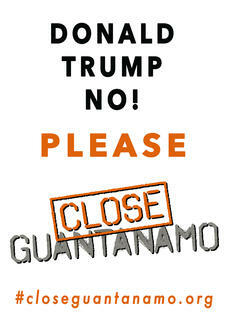 The poster for the Close Guantánamo campaign's new initiative urging Donald Trump to close Guantánamo. Poster designed by Benedick Tranchell, who also designed last year's Countdown to Close Guantánamo posters. 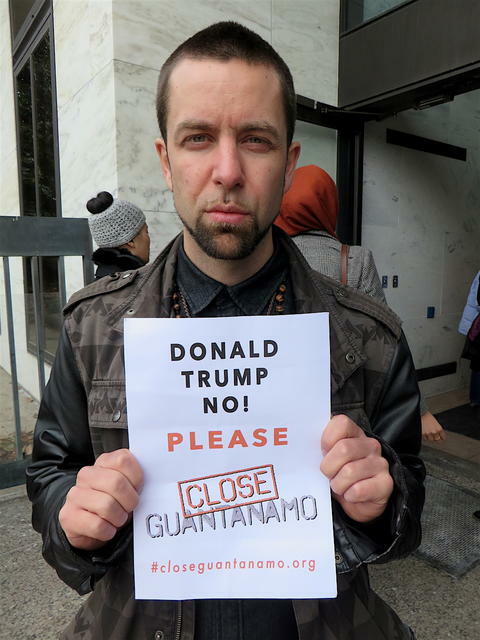 This page, set up on the day of Donald Trump’s inauguration, features photos of celebrities and concerned citizens from across the United States and worldwide, telling Donald Trump to close Guantánamo, and not to keep the prison open and "load it up with some bad dudes," as he promised on the campaign trail. 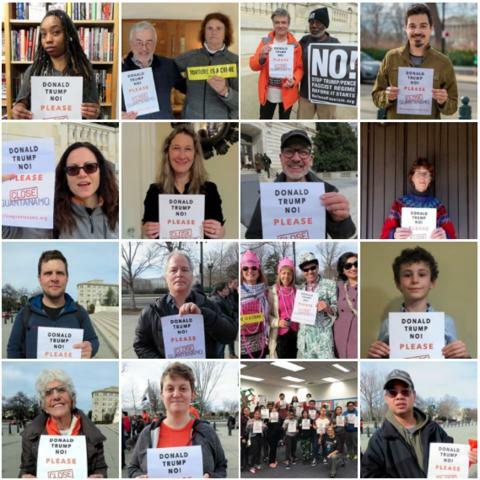 The campaign follows last year’s Countdown to Close Guantánamo, urging President Obama to fulfill the promise to close Guantánamo that he made on his second day in office back in January 2009. Over 700 photos were submitted during the year — see here and here. Unfortunately, despite a spate of last-minute releases, President Obama failed to fulfill his promise, and left 41 men still held at Guantánamo — five approved for release by high-level, inter-agency U.S. government review processes, ten facing trials, and 26 others facing ongoing Periodic Review Boards to assess whether they can be released. On Jan. 25, however, the New York Times published a leaked draft executive order proposing to reestablish "black sites" and torture as official U.S. policies, to keep Guantánamo open and to "suspend any existing transfer efforts pending a new review as to whether any such transfers are in the national security interests of the United States." 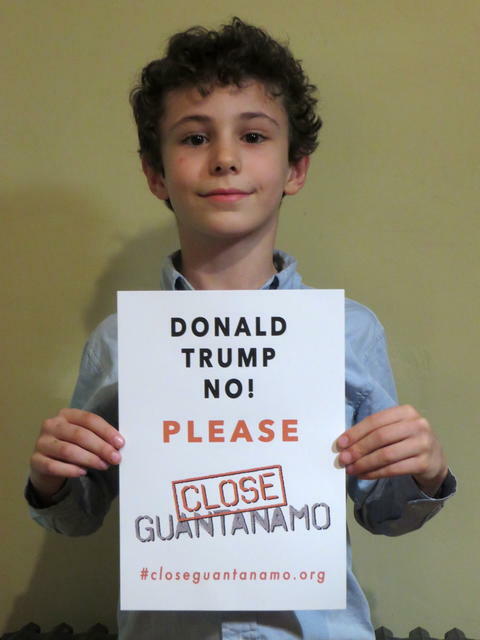 Please join us in demanding that Donald Trump abandon his plans and close Guantánamo for good. Print off a poster, take a photo with it, and send it to us. We’ll post the photos here, and on our Facebook and Twitter pages. Throughout the first year of this most troubling presidency, we've generally been posting one photo every ten days, to provide maximum exposure to those taking part, and we ask again: Please join us. Let's show Trump that we know the difference between right and wrong, and demand that he closes this wretched prison that does so much damage to America's reputation, and its ability to claim that it is a nation founded on the rule of law, both at home and abroad. 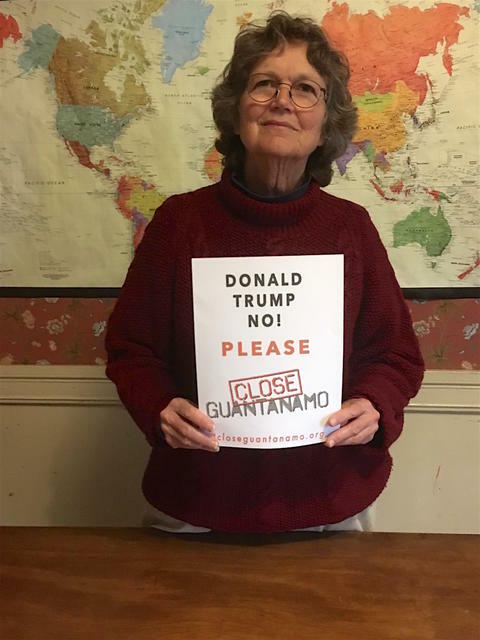 On the last day of 2017 (Day 346 of Donald Trump’s presidency, and just 11 days before the 16th anniversary of the opening of the prison at Guantánamo Bay), Susan McLucas, in the Boston area, calls on Donald Trump to close Guantánamo immediately, and not to let its injustice linger on for another year. She says, "Thanks for collecting these photos. Maybe we'll soften Trump's heart." 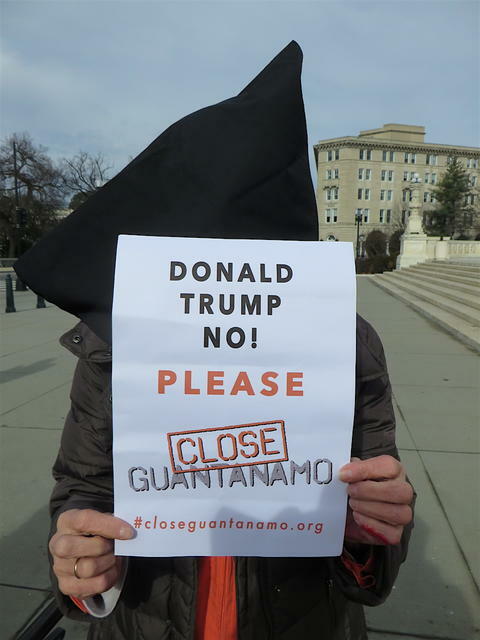 This is the last day - and the last photo - of the Close Guantánamo poster campaign we began on the day of Donald Trump's inauguration. Tomorrow, we’re launching a brand-new campaign, involving a revival of the Gitmo Clock that we first launched under President Obama, and a new opportunity for you to send in photos. Watch this space! On the last day of 2017 (Day 346 of Donald Trump’s presidency, and just 11 days before the 16th anniversary of the opening of the prison at Guantánamo Bay), Alice and Lincoln Day are seen here in a Thanksgiving photo taken with family and friends in San Francisco. 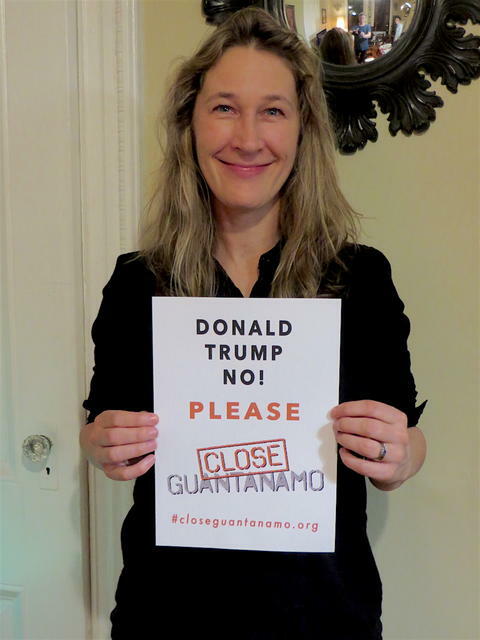 They say, "We will all be thankful if Donald Trump closes Guantánamo!" From L to R: Keith Burkland, Joe and Linda Mckenzie, Cristian Santesteban, Caroline Day. Photo by Julian Santesteban. 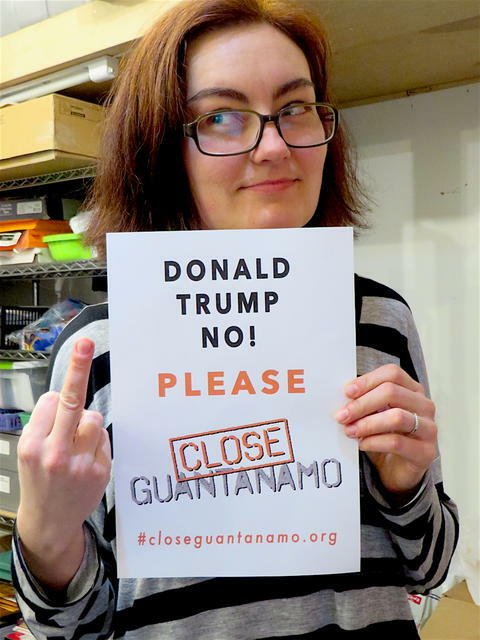 This is the last day of the Close Guantánamo poster campaign we began on the day of Donald Trump's inauguration. Tomorrow, we’re launching a brand-new campaign, involving a revival of the Gitmo Clock that we first launched under President Obama, and a new opportunity for you to send in photos. Watch this space! 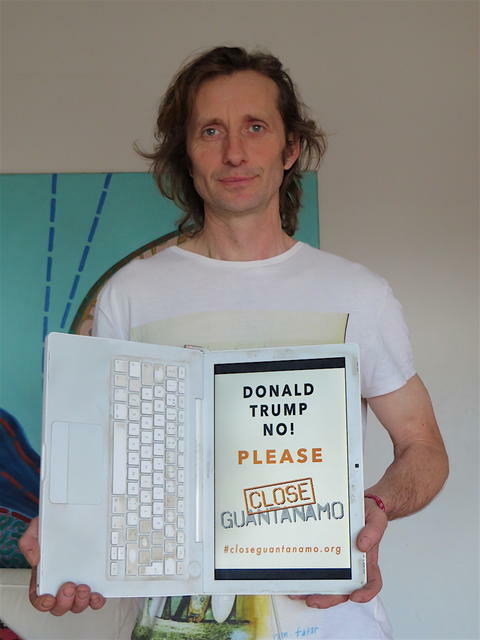 On the last day of 2017 (Day 346 of Donald Trump’s presidency, and just 11 days before the 16th anniversary of the opening of the prison at Guantánamo Bay), Phillip Bannowsky, a U.S.-based writer and human rights activist, calls on Donald Trump not to let the prison be a blight on America’s standing in the world in 2018, and to close it immediately. Here is a 22-minute video of excerpts from Phillip’s novel in verse, Jacobo the Turko, a mixture of fiction and fact about a guest worker from Ecuador in the USA who ends up in Gitmo. 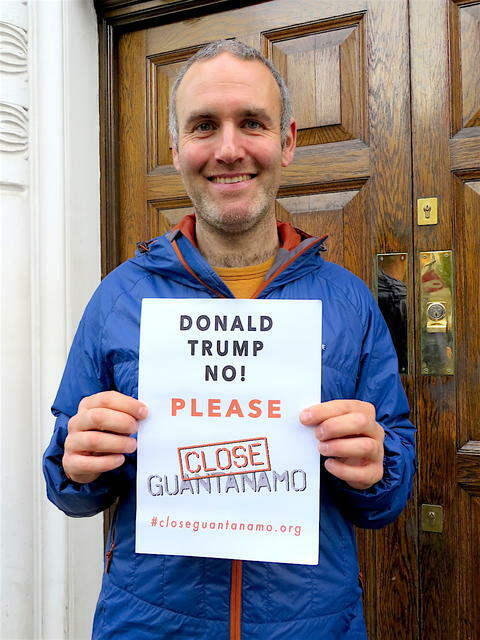 On Day 345 of the Trump presidency, with less than two weeks until the 16th anniversary of the opening of Guantánamo, Sam Raphael, Senior Lecturer in International Relations at the University of Westminster, in London, calls on Donald Trump to close the prison, and not to continue its miserable injustice indefinitely. Close Guantánamo co-founder Andy Worthington has undertaken several events in London with Sam, who is also the co-founder, with Professor Ruth Blakeley at the University of Sheffield, of The Rendition Project, a project to research the CIA's rendition, detention and interrogation (RDI) program, which includes "the most comprehensive account to date of the fate and whereabouts of each of those detained and tortured within the program," and which has been described by the Guardian as a "groundbreaking research project which sheds unprecedented light on one of the most controversial secret operations of recent years." 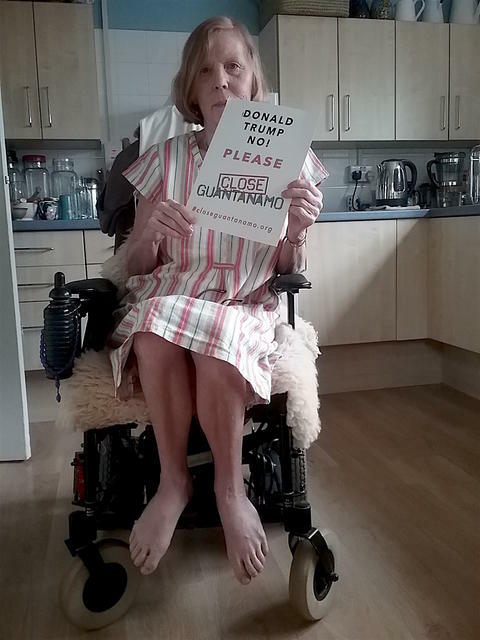 On Day 335 of the Trump presidency, with just three weeks to go until the 16th anniversary of the opening of Guantánamo, Enid Walker, in Ceredigion, Wales calls on Donald Trump to close the prison once and for all, and to remove this terrible stain on the U.S.’s reputation. 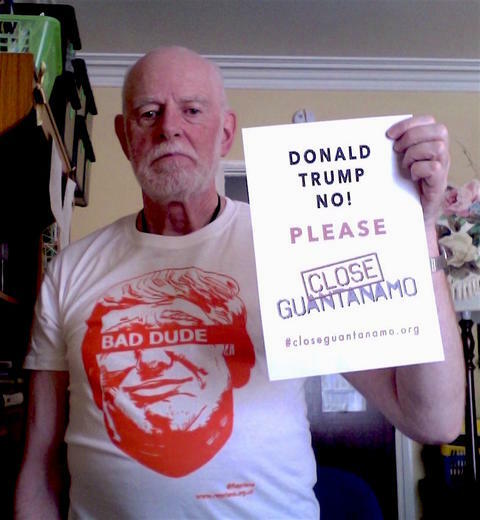 On Day 330 of the Trump presidency, with less than a month to go until the 16th anniversary of the opening of Guantánamo, Gwilym and Laurie Gardiner, from Pembrokeshire, in Wales, call on Donald Trump to close the prison once and for all. 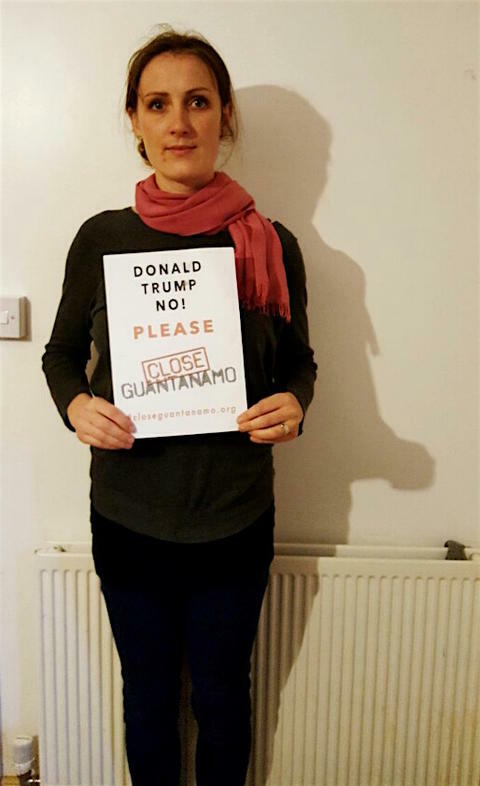 On Day 320 of the Trump presidency, Alice Gardiner, from Pembrokeshire, in Wales, calls on Donald Trump not to perpetuate a chronic injustice for another year by keeping Guantánamo open. 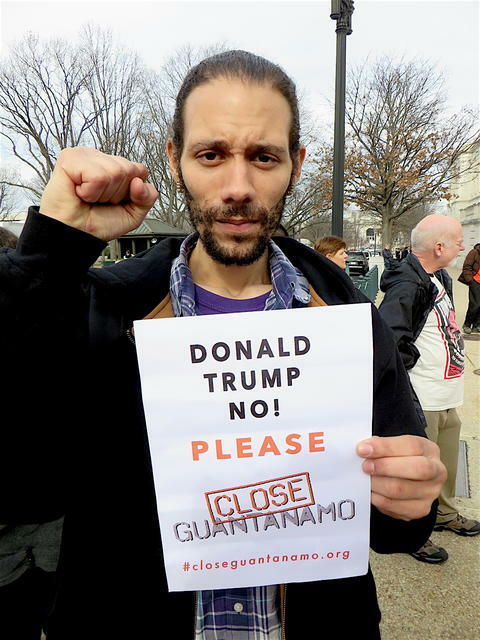 On Day 310 of the Trump presidency, Jesse Williams, the bassist of the New York-based rock band Outernational, described by Tom Morello of Rage Against The Machine as "an uncompromisingly politically revolutionary band," calls on Donald Trump to close Guantánamo, as we approach the 16th anniversary of the opening of the prison, on January 11, 2018. 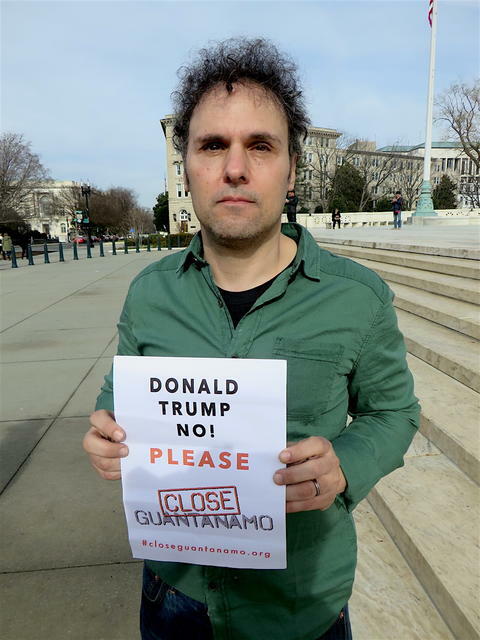 On Day 300 of the Trump presidency, Miles Solay, the lead singer of the New York-based rock band Outernational, described by Tom Morello of Rage Against The Machine as "an uncompromisingly politically revolutionary band," calls on Donald Trump to close Guantánamo, and also to allow independent medical experts to visit the prison to assess the health of a number of long-term hunger strikers, who claim that, under new instructions implemented from September 20 onwards, the authorities are no longer trying to feed them, or even to monitor their health. 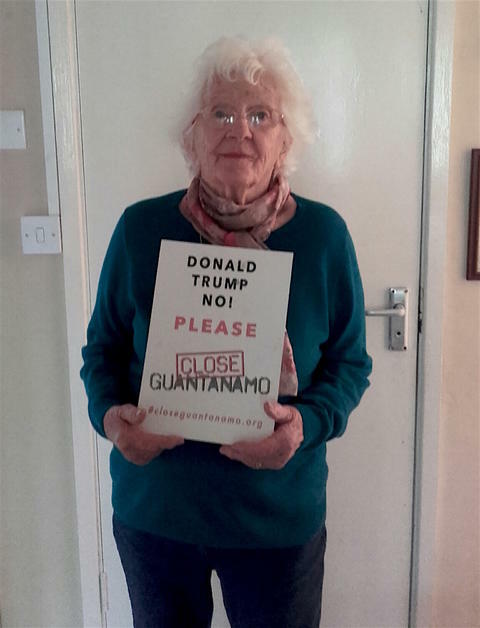 On Day 290 of the Trump presidency, 86-year old Eve Tetaz, a former schoolteacher from Washington, D.C., and a campaigner with Witness Against Torture, calls for Donald Trump to close Guantánamo, and not to keep it open and to send new prisoners there, as he keeps threatening to do. We posted a photo of Eve without a hood earlier this year, and explained at the time that she has been arrested - and imprisoned - on numerous occasions for protesting, and "in a video on Twitter, after she was arrested on the 15th anniversary of the opening of Guantánamo, on Jan. 11 this year, she was asked, 'Why was it important for you to get arrested today?' and replied, 'Because of my brothers who are still detained in Guantánamo. I want them to know and the world to know, and my government [and] the courts to know that I am in solidarity with them. Torture is wrong. It’s a crime against humanity.' Also check out this Washington Post profile from 2010. 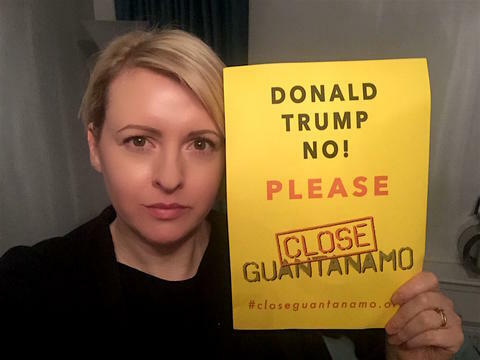 On Day 280 of the Trump presidency, Jen Thomas in Wales calls on Donald Trump to close Guantánamo, and to allow independent medical experts to visit the prison to assess the hunger striking prisoners, who, since a new policy was introduced on September 20, are being allowed to starve to death. Jessica Hope, who sent the photo, wrote, "This is my friend Jen Thomas, from Newport, Pembrokeshire. She is ill and disabled. She's mostly bedbound. She knows about suffering, but has huge empathy for the men left in Guantánamo. Now many suffer ill health, and are aging, with no end in sight to their incarceration and no visits from loved ones. It's a truly desperate situation. Come on Trump, have a heart, we all need human rights!" 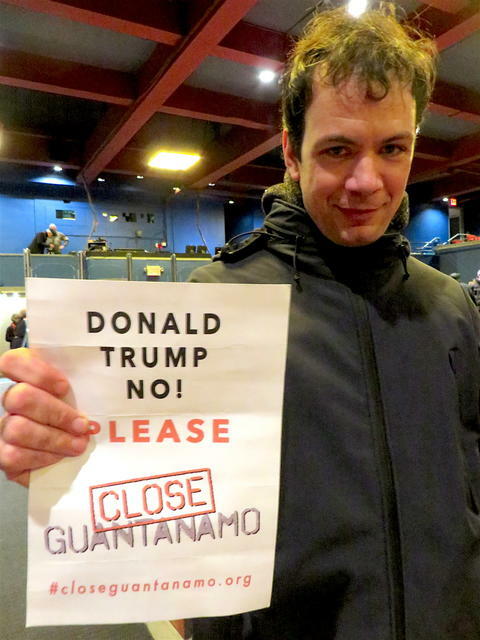 On Day 270 of the Trump presidency, Mathew Terry, in Wales, calls on Donald Trump to close Guantánamo — and, since the news broke less than two weeks ago, to drop his newly-revealed policy of allowing hunger strikers to starve to death. 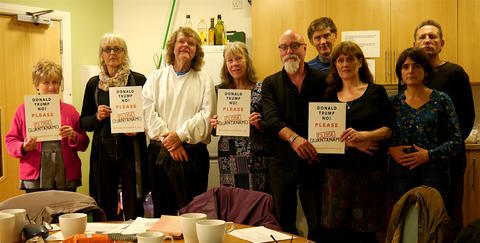 To get involved further, please sign Reprieve’s petition to Donald Trump, calling for independent medical experts to be allowed to visit and assess the hunger strikers, and for the prison to be closed, which currently has over 18,000 signatures, and, if you wish, join the fast in solidarity with the prisoners, along with Reprieve’s founder Clive Stafford Smith and hundreds of other supporters. 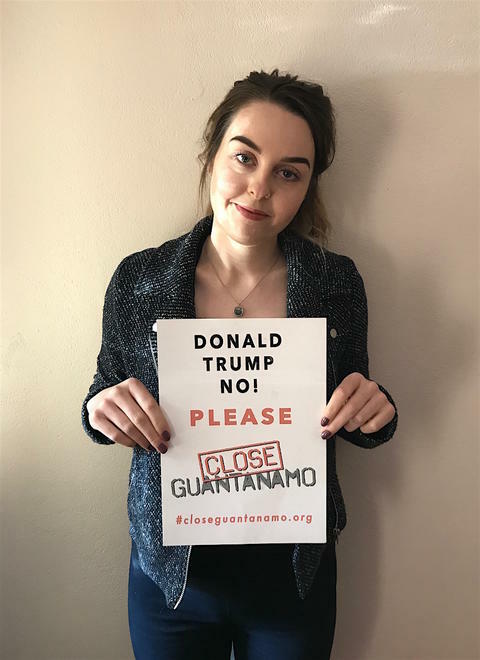 On Day 260 of the Trump presidency, Hannah Rogers in Wales calls on Donald Trump to close Guantánamo, and not to officially keep it open and expand its use, as he is clearly determined to try to do. 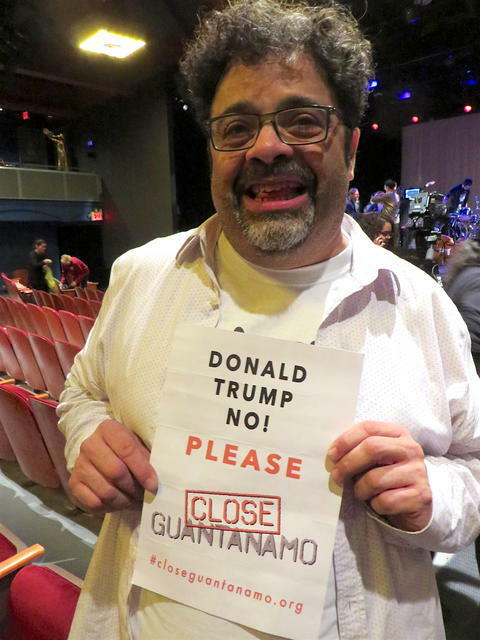 On Day 250 of the Trump presidency, jazz musician Arturo O’Farrill calls on Donald Trump to close Guantánamo, and not to persist with his wretched notions of officially keeping it open and sending new prisoners there. Arturo O’Farrill, born in Mexico and raised in New York City, is the son of Latin jazz musician, arranger and bandleader Chico O'Farrill, and is the director, composer and pianist for the Afro Latin Jazz Orchestra. He has received two Grammy Awards for his work. In January, the night before Donald Trump’s inauguration, Arturo hosted "Musicians Against Fascism," an extraordinary event at Symphony Space, on Broadway in New York City, and a fundraiser for the newly-formed anti-Trump organization, Refuse Fascism. The concert brought together dozens of the most talented jazz musicians and singers in New York to oppose Trump’s presidency. I was honored to watch the concert, which lasted for several exhilarating hours, and to realize that most of the performers knew full well what they had to fear from a presidency in which racism is prominent, as two performances made clear — Billie Holiday’s "Strange Fruit," sung by Somi feat. Toru Dodu (piano) and Liberty Ellman (guitar), at around 1 hour and 30 minutes, and Nina Simone’s "Four Women" by Amirtha Kidambi and the Elder Ones — Max Jaffe (drums), Brandon Lopez (bass) — at around 50 minutes. Arturo’s introduction to the concert is here. And the whole three and a half hour concert is here. 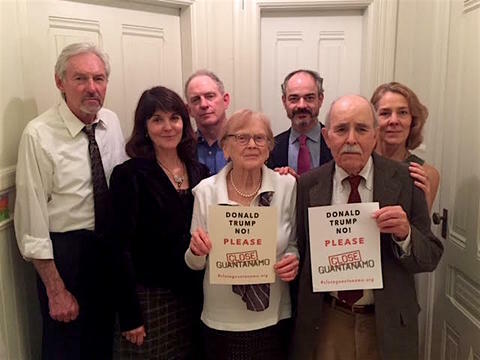 On Day 240 of the Trump presidency, Cardigan and North Pembrokeshire Amnesty Group say, "Donald Trump, please close Guantánamo and Make America Great Again!" 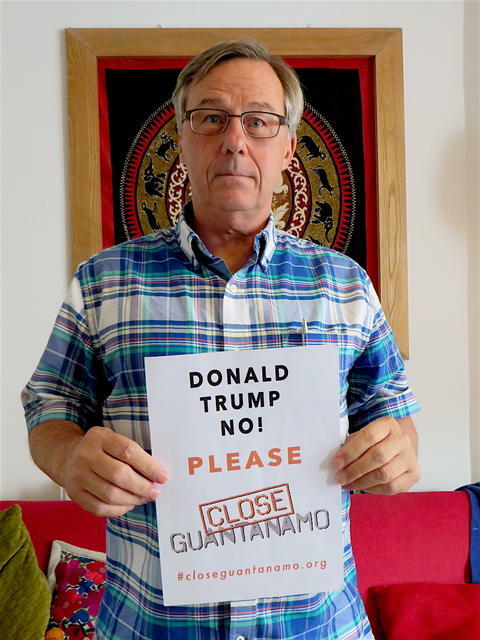 On Day 230 of the Trump presidency, please join this activist with Witness Against Torture in calling on Donald Trump to close Guantánamo and to abandon his outrageous and unacceptable ongoing plans to keep the prison open and to send new inmates there. 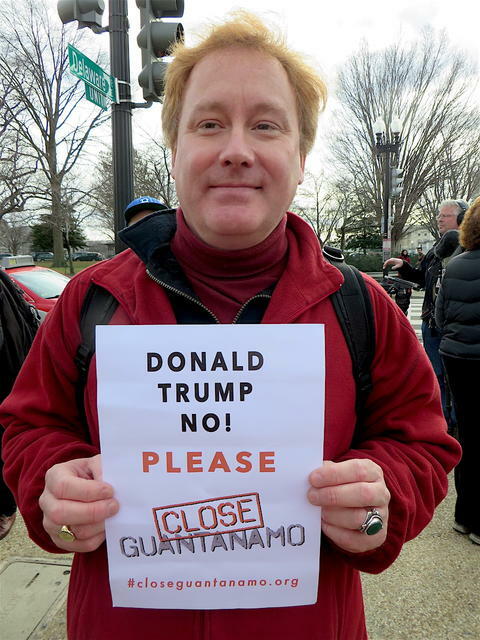 On Day 220 of the Trump presidency, Patrick O'Dougherty, an activist with Witness Against Torture, calls on Donald Trump to close Guantánamo without further delay. 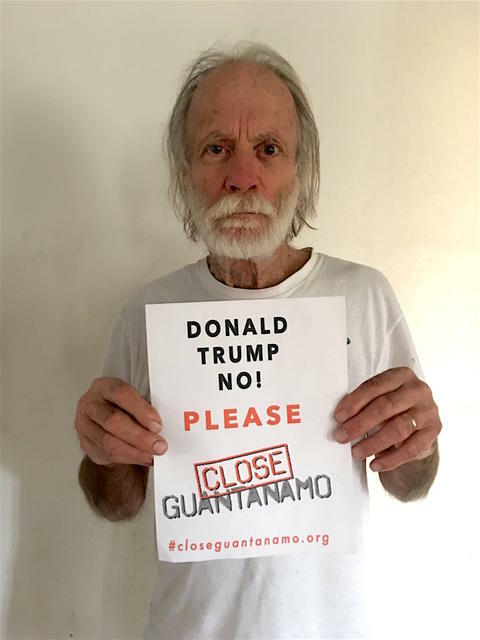 On Day 200 of the Trump presidency, Todd Pierce, Major, U.S. Army Judge Advocate General Corps (retired), who represented Guantánamo prisoners as a military defense attorney in their military commission trials, calls on Donald Trump to close Guantánamo without further delay. Todd is a passionate and implacable opponent of the U.S.'s essentially unfettered militarism, and to find out more please read this detailed interview on Mondoweiss - and Part 2 here. 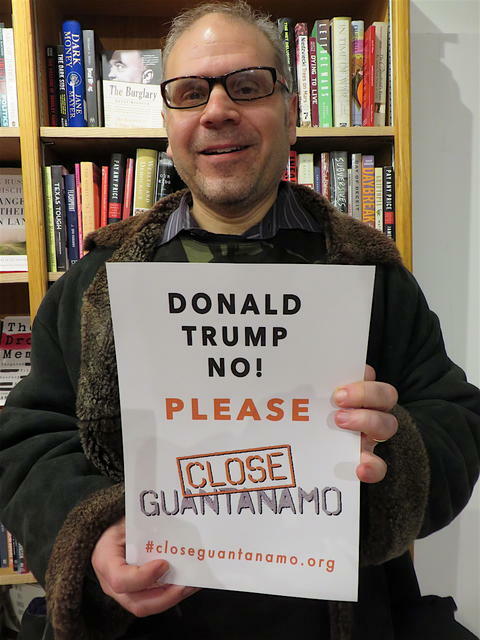 On Day 195 of the Trump presidency, Mark, an activist with the World Can't Wait in New York City, calls on Donald Trump to close Guantánamo without further delay. 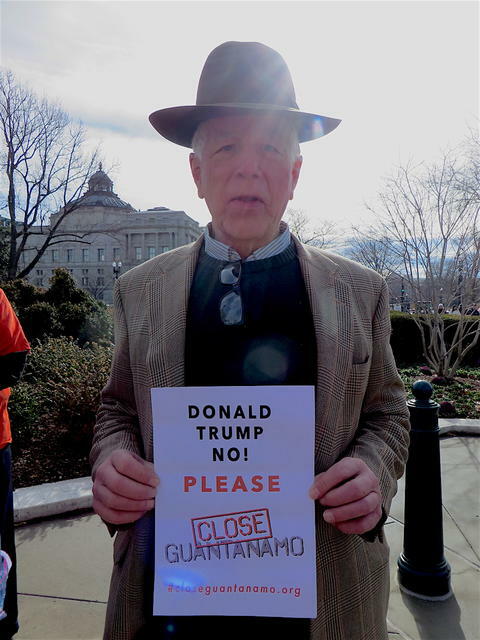 On Day 185 of the Trump presidency, Frank Harper of the World Can't Wait calls on Donald Trump to close Guantánamo. Six months into his presidency, Trump has done little with Guantánamo except to indicate that he has no intention of releasing anyone, even though five of the 41 men still held were unanimously approved for release by high-level governmental review processes under President Obama. 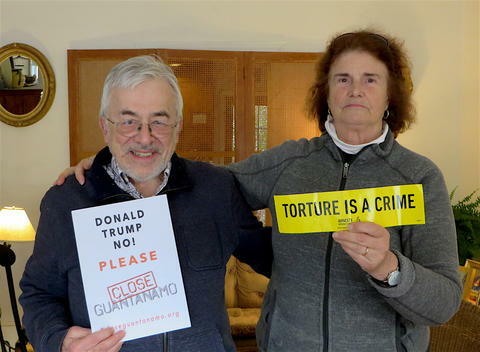 On Day 175 of the Trump presidency, Tom Hall and Susan Hall in Colorado call on Donald Trump to close Guantánamo, and not to keep it open as he is clearly happy to do. Since he took office six months ago, no one has been appointed to deal with Guantánamo inside his administration, and no one has been released, even though five of the 41 men still held were unanimously approved for release after high-level inter-agency reviews under President Obama. On U.S. Independence Day (Day 165 of the Trump presidency), Close Guantánamo co-founder Andy Worthington says, "Today, all decent Americans are aware that the tyranny the Founding Fathers overthrew 241 years ago is, to their shame, being applied at Guantánamo to the men held without rights as a result of the brutal and counter-productive “war on terror” that the Bush administration declared after the terrorist attacks of September 11, 2001. Unfortunately, far too many Americans either do not know or do not care, meaning that we must continue to do all we can to raise awareness of Guantánamo, even as it disappears from public consciousness, drowned out in the general madness of Donald Trump’s presidency." On U.S. 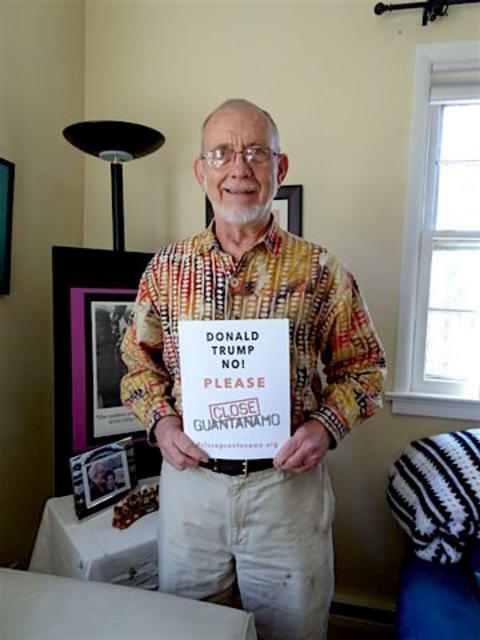 Independence Day (Day 165 of the Trump presidency), Steve Lane, in Bethesda, Maryland, says, "President Trump, you can show the world how America is still great, by releasing those men found to be innocent but nevertheless held at Guantánamo Bay." On U.S. 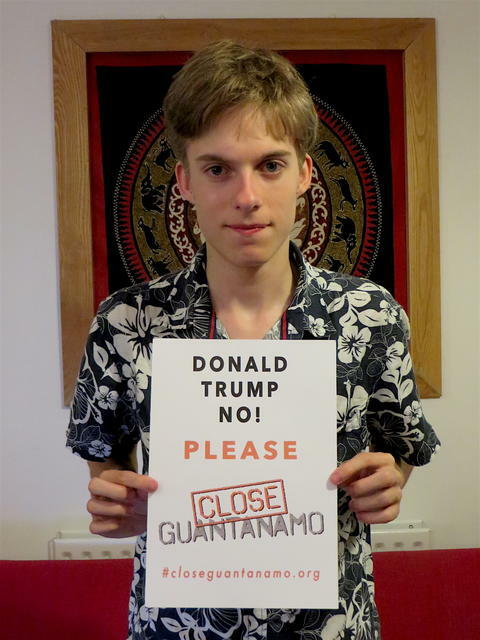 Independence Day (Day 165 of the Trump presidency), Tyler Worthington, a student and beatboxer in London, and the son of Close Guantánamo co-founder Andy Worthington, calls on Donald Trump to close Guantánamo once and for all. 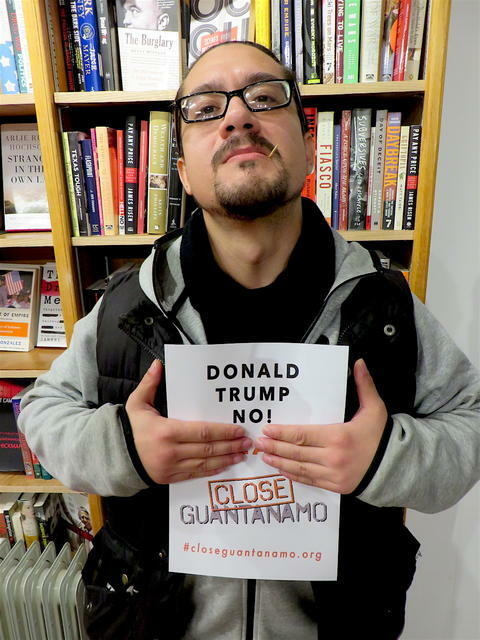 On Day 150 of the Trump presidency, Abe Velazquez of The Peace Poets, spoken word artists based in the Bronx, New York, calls on Donald Trump to close Guantánamo. Check out Abe with Luke Nephew and Enmanuel Candelario of The Peace Poets performing "The Moment We Blush," about the significance of Donald Trump’s presidency, at an event in Washington, D.C. in January 2017, the day before the 15th anniversary of the opening of the prison, and ten days before Donald Trump's inauguration. 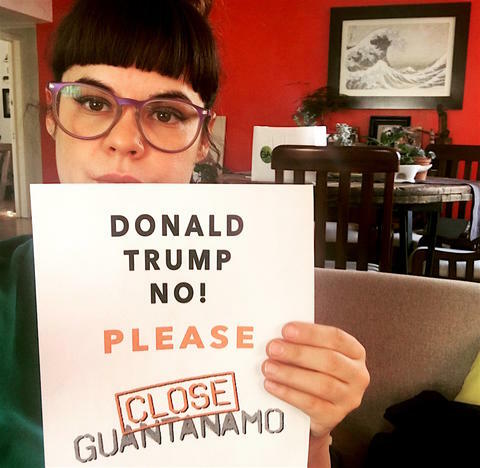 On Day 145 of the Trump presidency, Lina, a supporter of the World Can't Wait and RefuseFascism.org, calls on Donald Trump to close Guantánamo in no uncertain terms! 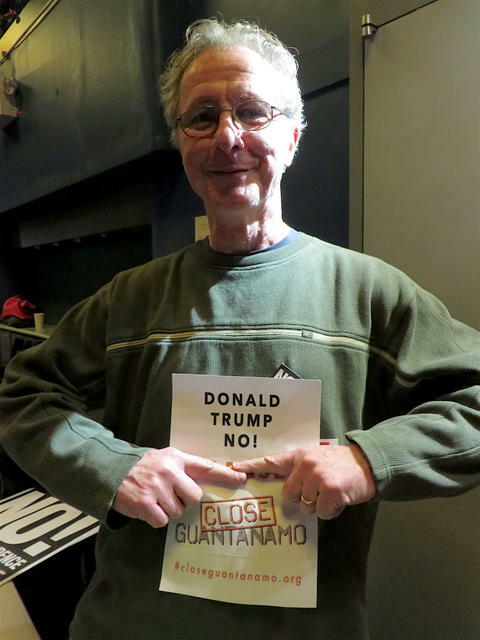 On Day 135 of the Trump presidency, Jim Fouratt, activist and entertainer, in New York City, calls on Donald Trump to close Guantánamo. 41 men are still held in the lawless prison, and Trump shows no signs of wanting to either release them or deliver justice to them. Please join us, and please also consider getting involved in Witness Against Torture's "Forever Human Beings" campaign, running for 41 days from May 26 to July 5, 2017. 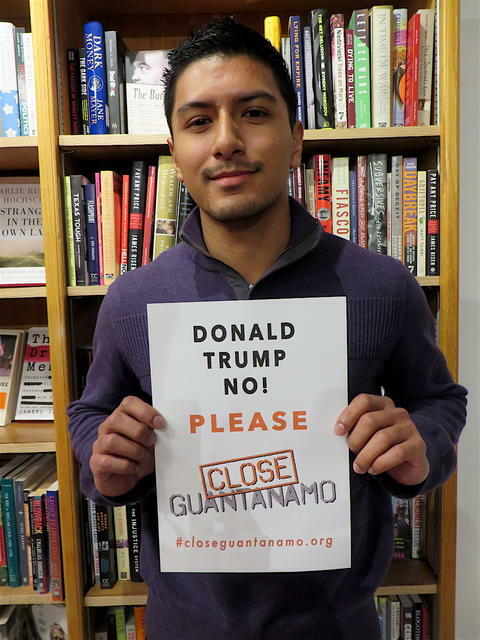 On Day 125 of the Trump presidency, Noche RC, a supporter of the World Can't Wait and RefuseFascism.org from the Bronx, New York City, calls on Donald Trump to close Guantánamo without further delay, and made a point of deliberately obscuring the word "please" on the poster. 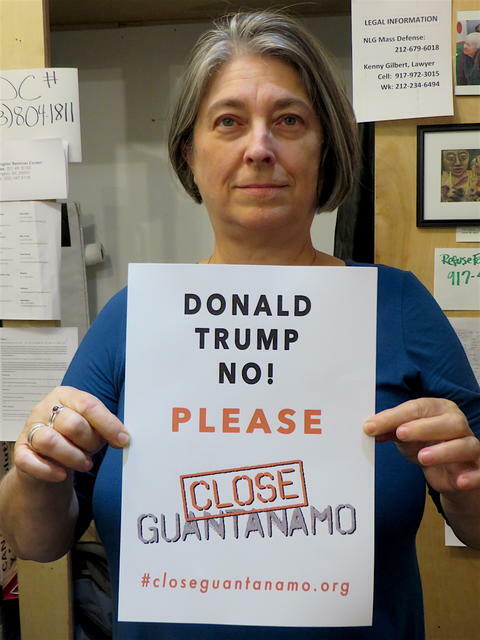 On Day 120 of the Trump presidency, Cat Watters, an activist in New York City, calls on Donald Trump to close Guantánamo. On Day 115 of the Trump presidency, Arthur Sayed, in New York City, calls on Donald Trump to close Guantánamo. He recently read the newly-published book, Witnesses of the Unseen: Seven Years in Guantánamo, by former prisoners Lakhdar Boumediene and Mustafa Ait Idir, and stated, "I’ve often wondered (quite naively) why wrongfully imprisoned Guantánamo releasees have not come out in stronger numbers and louder voices, to speak against the indefinite detention of those who remain. Reading the first-hand accounts of the ripping away from their lives, their families, the beatings and torture they were subject to, the lab-rat and slave like treatment from American soldiers and medical professionals, and the indifference of the authorities due to politics, and it is clear that these men have had so much livelihood taken away from them, that even the act of taking a breath in the morning is a struggle for them. Both stories were a cause for deep anger and spelled out the need for people like you to do the work you do." 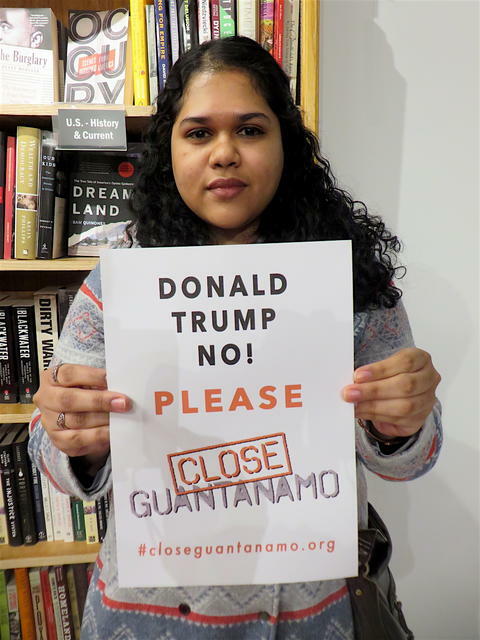 On Day 105 of the Trump presidency, Shahela Begum, in New York City, calls on Donald Trump to close Guantánamo. 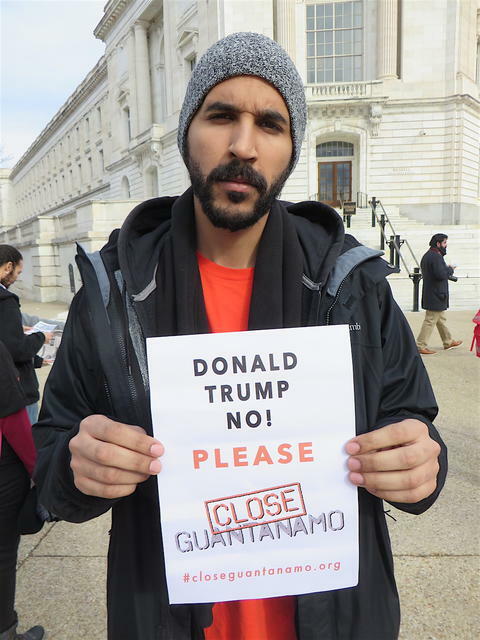 On Day 100 of the Trump presidency, Enmanuel Candelario of The Peace Poets, spoken word artists based in the Bronx, New York, calls on Donald Trump to close Guantánamo. Check out Enmanuel performing "The Greatest Gift," his powerful poem about Guantánamo and other U.S. crimes, at an event in Washington, D.C. in January 2016 (when 107 men were still held, compared to 41 now), to mark the 14th anniversary of the opening of the prison. And also watch Enmanuel with The Peace Poets performing "The Moment We Blush," about the significance of Donald Trump’s presidency, at an event in January 2017. 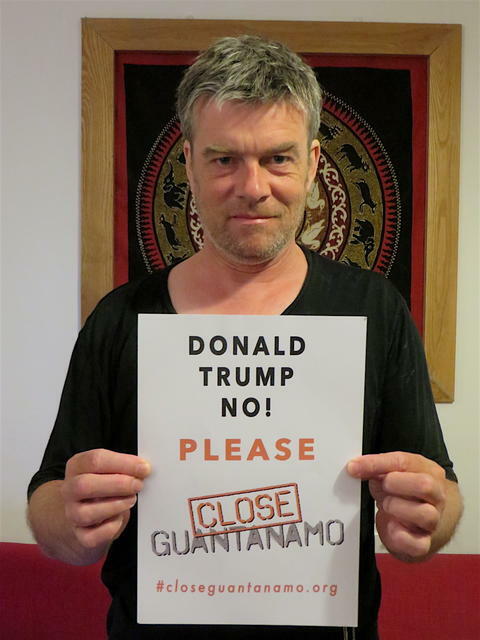 On Day 97 of the Trump presidency, Richard Clare, guitarist and backing vocalist with The Four Fathers (the band in which Close Guantánamo co-founder Andy Worthington is the lead singer), calls on Donald Trump to close Guantánamo. Check out The Four Fathers playing their song, "Close Guantánamo," which was featured in the most recent Close Guantánamo promotional video. 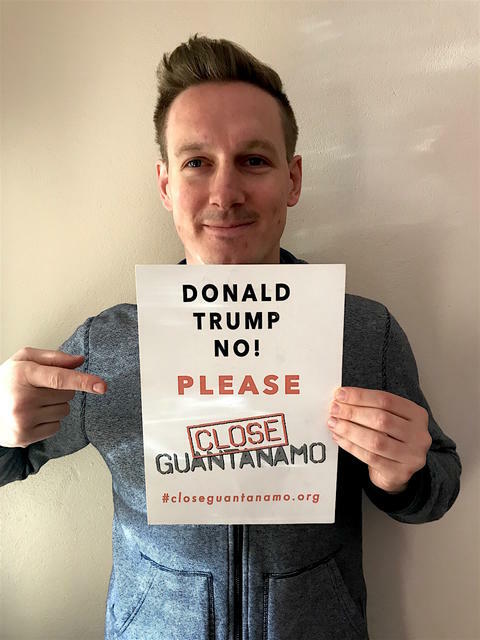 On Day 96 of the Trump presidency, Brendan Horstead, the drummer with The Four Fathers (the band in which Close Guantánamo co-founder Andy Worthington is the lead singer), calls on Donald Trump to close Guantánamo. Check out The Four Fathers playing their song, "Close Guantánamo," which was featured in the most recent Close Guantánamo promotional video. 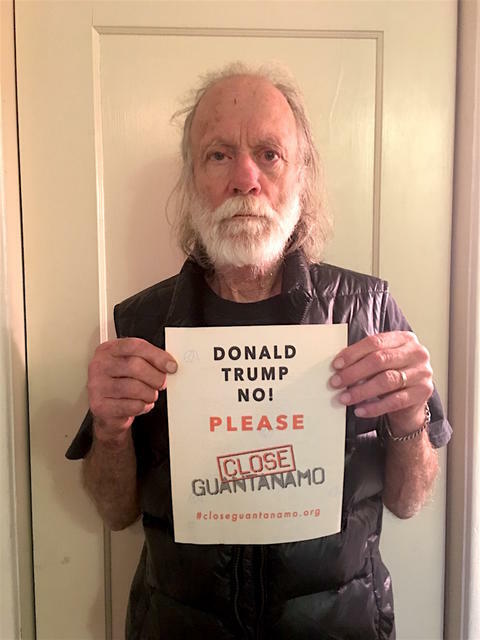 On Day 95 of the Trump presidency, Mark Quiney​, the new bassist with The Four Fathers (the band in which Close Guantánamo co-founder Andy Worthington is the lead singer), calls on Donald Trump to close Guantánamo. Check out The Four Fathers playing their song, "Close Guantánamo," which was featured in the most recent Close Guantánamo promotional video. 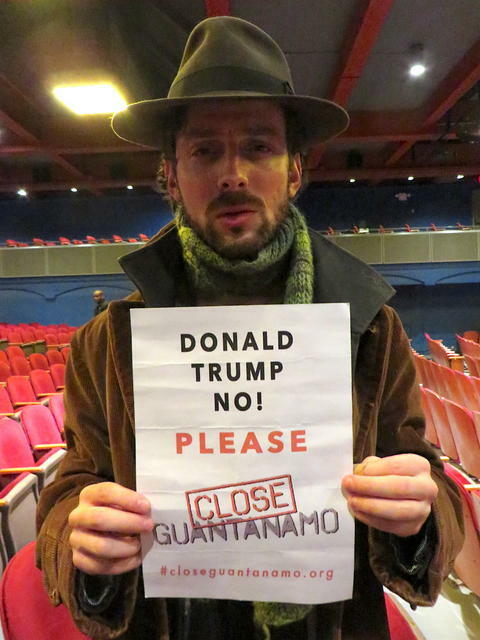 On Day 90 of the Trump presidency, Luke Nephew​ of The Peace Poets, spoken word artists based in the Bronx, New York, calls on Donald Trump to close Guantánamo. Check out the videos of Luke reciting his poems, "There Is A Man Under That Hood," outside the White House on January 11, 2015 (the 13th anniversary of the opening of the prison), and "The Waters of Guantánamo Bay," during a Witness Against Torture​ visit to Cuba in November 2015. 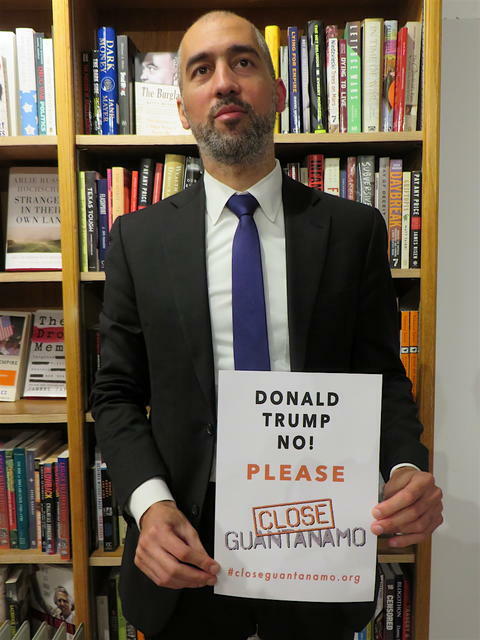 On Day 80 of the Trump presidency, Ramzi Kassem, law professor at City University of New York, calls on Donald Trump to close Guantánamo. Ramzi and his students represent prisoners held at Guantánamo, and, as he explained in an op-ed for Vice News in 2015, "When people call for Guantánamo to be closed, it is simply shorthand for a more comprehensive demand to end torture and arbitrary, indefinite imprisonment without trial or fair process." 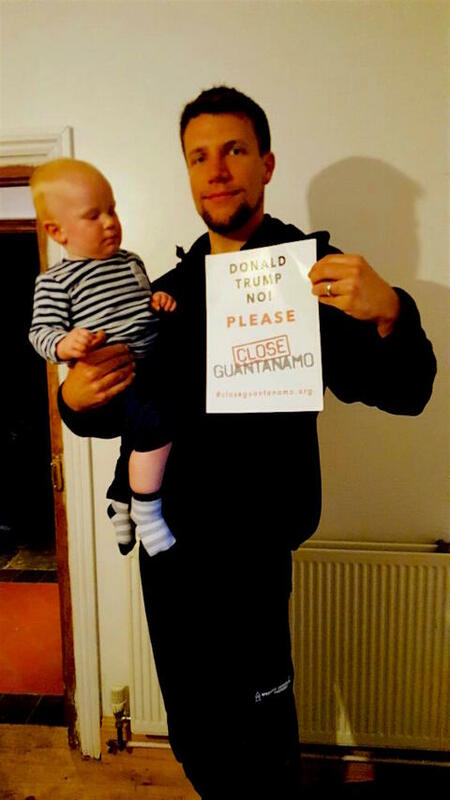 On Day 77 of the Trump presidency, Ian Clark, in Whitby, North Yorkshire, calls on Donald Trump to close Guantánamo. He says, "Are you human? Then Guantánamo is a crime against you. Can't feel anything yet? By the time the poison trickles down to you, I want it on record that I was one of those that put my face to the public call to shut it. To declare that poison-gassing children crosses a red line whereas locking people up forever without charge and torturing them doesn't, is to gerrymander your red lines to suit your PR dept." Ian is also wearing a new 'Bad Dude' T-shirt featuring Trump that has just been made available by the human rights organization Reprieve​. 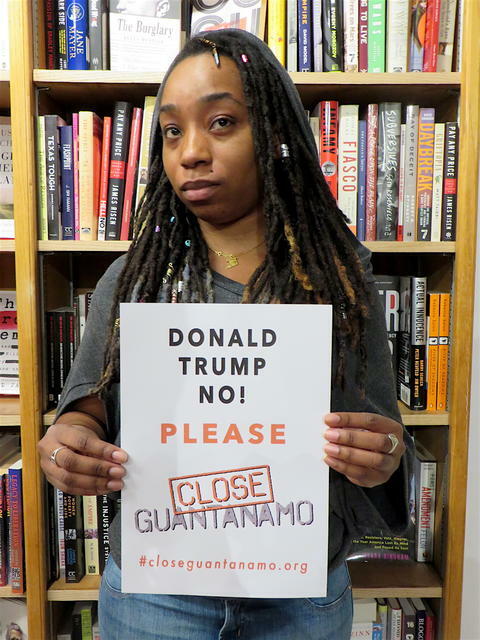 On Day 74 of the Trump presidency, Patrice, a volunteer at Revolution Books in Harlem, calls on Donald Trump to close Guantánamo. When our co-founder, Andy Worthington, met Patrice in January, she had just started working at Revolution Books, politicized by Donald Trump's election, and she filmed Andy's Guantánamo event with law professor Ramzi Kassem, available here. 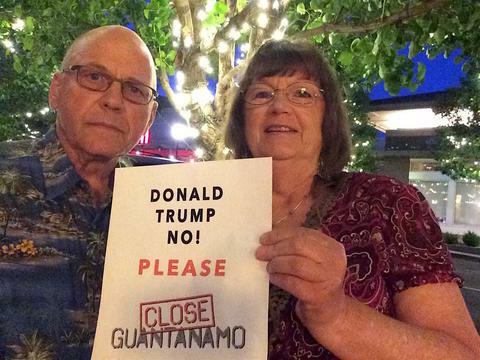 On Day 70 of the Trump presidency, John and Debby Hanrahan, activists in Washington, D.C., call on Donald Trump to close Guantánamo. They say, "We must continue the struggle to close this shameful symbol of U.S. war crimes, ensure that it not be replicated elsewhere, and reinstitute the rule of law that has been cast into darkness for the last 15 years. With Donald Trump apparently intent on escalating the 'global war on terror' (or whatever he is calling it) and threatening to put even more 'bad dudes' in Guantanamo, our continued commitment to closing this inhumane torture-chamber of a prison must be paramount." 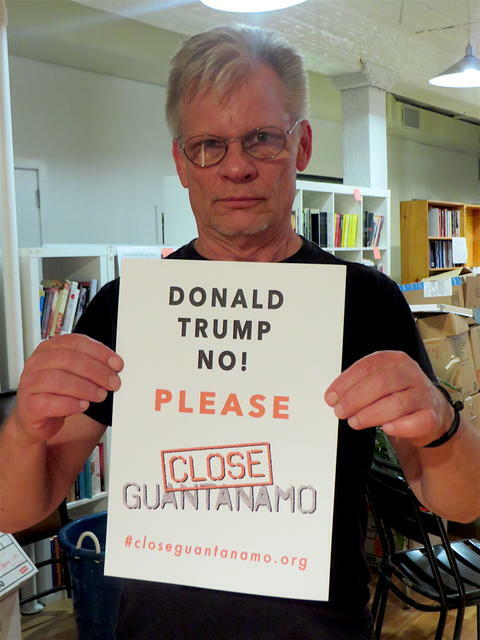 On Day 66 of the Trump presidency, activist Carl Dix joins Close Guantánamo co-founder Andy Worthington to demand that Donald Trump closes Guantánamo, and doesn't keep it open and send new prisoners there, as he has threatened to do. 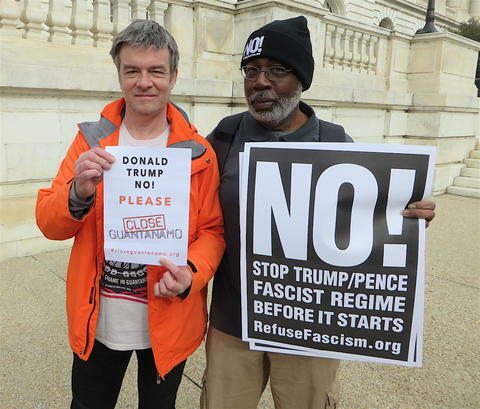 Carl is part of the Refuse Fascism movement, which has been campaigning against the threat posed by Donald Trump since his election last November. 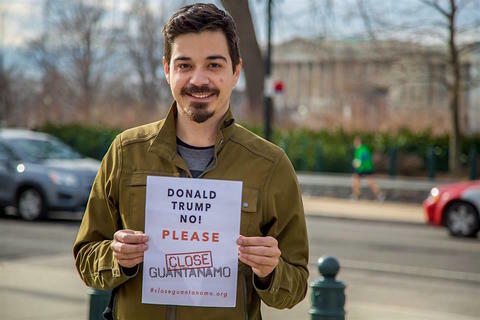 On Day 63 of the Trump presidency, Justin Norman, Witness Against Torture's excellent designer, photographer and filmmaker calls on Donald Trump to close Guantánamo, and not to keep it open and to send new prisoners there as he has threatened to do. Check out Justin's latest film for WAT here. 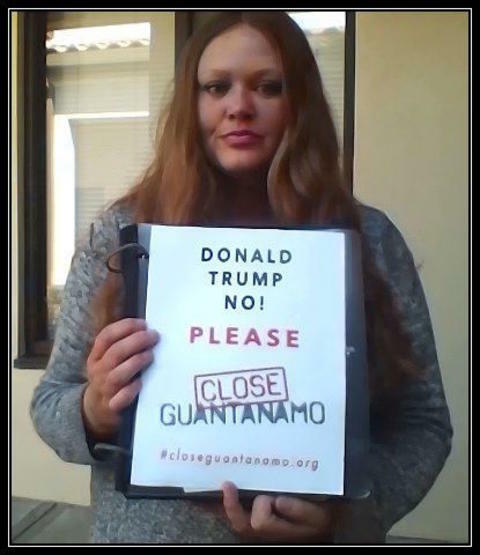 On Day 60 of the Trump presidency, Sunsara Taylor of the World Can't Wait and the Refuse Fascism movement calls on Donald Trump to close Guantánamo. Sunsara framed this as a demand; she wasn't interested in the poster saying "please." Join us! 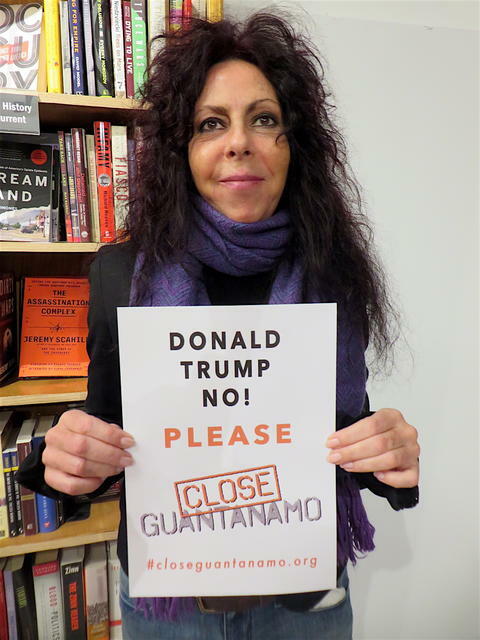 On Day 56 of the Trump presidency, Alice Varon in New York City calls on Donald Trump to close Guantánamo, and not to keep it open and to send new prisoners there, as he is threatening to do. Please join us! 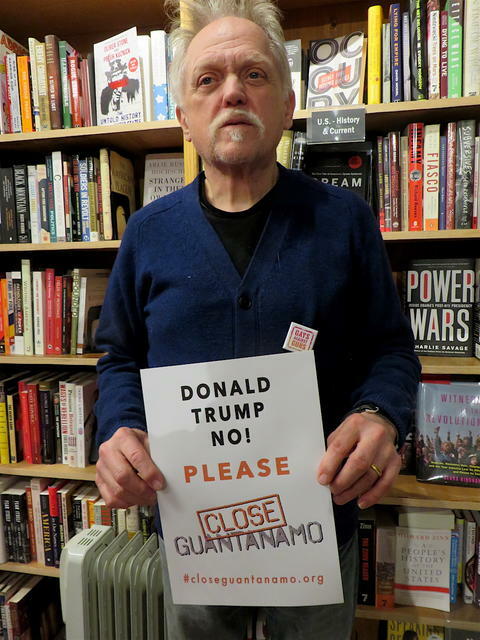 On Day 53 of the Trump presidency, Bob Parsons of the World Can't Wait calls on Donald Trump to close Guantánamo. Also check out Bob disrupting Jeff Sessions' confirmation hearing in Washington, D.C. on January 10 this year, with other activists working as part of the Refuse Fascism movement. 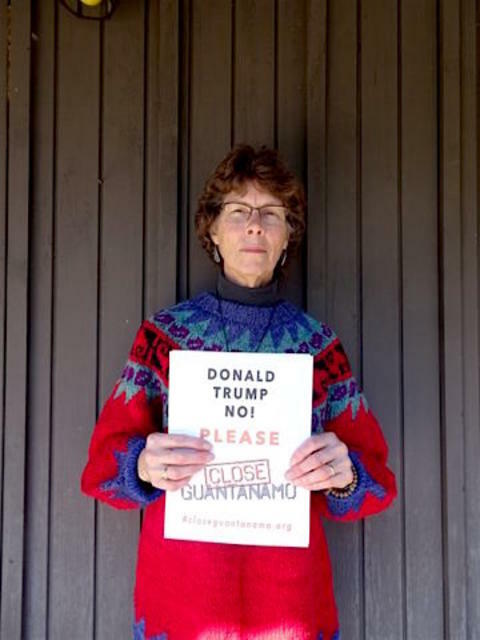 On Day 50 of the Trump presidency, Helen Schietinger, a member of Witness Against Torture and the Phil Berrigan Reflection Group (named after the prominent peace activist, who died in 2002), calls on Donald Trump to close Guantánamo. 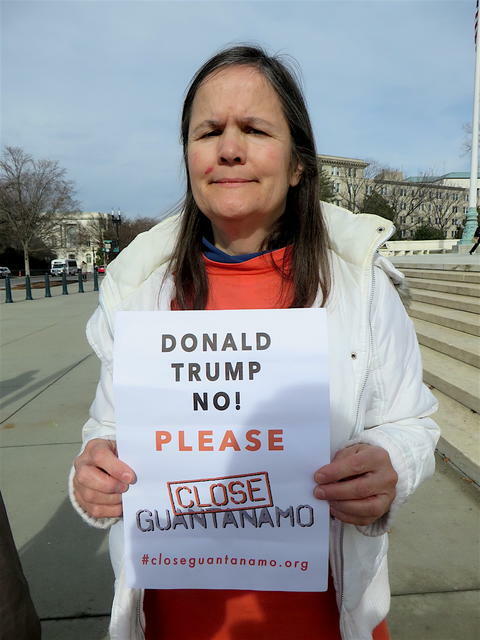 Helen says, "The very existence of Guantánamo represents the flouting of basic legal standards our nation is founded on." She was photographed by Judith Kelly in Accokeek, Maryland. 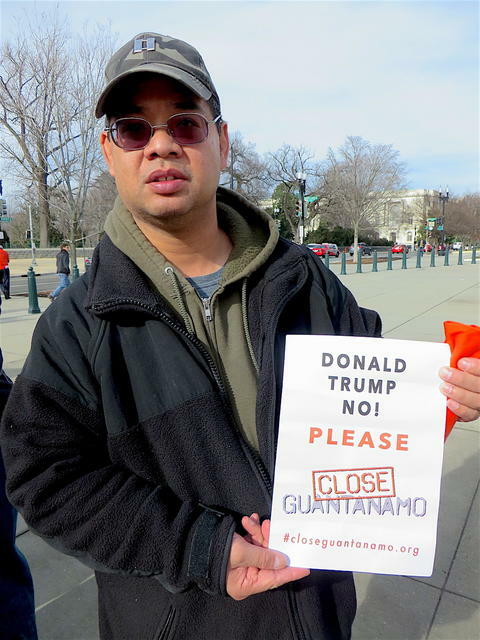 On Day 50 of the Trump presidency, Jerry Park, a member of the Phil Berrigan Reflection Group (named after the prominent peace activist, who died in 2002), calls on Donald Trump to close Guantánamo. He was photographed by Judith Kelly in Accokeek, Maryland. 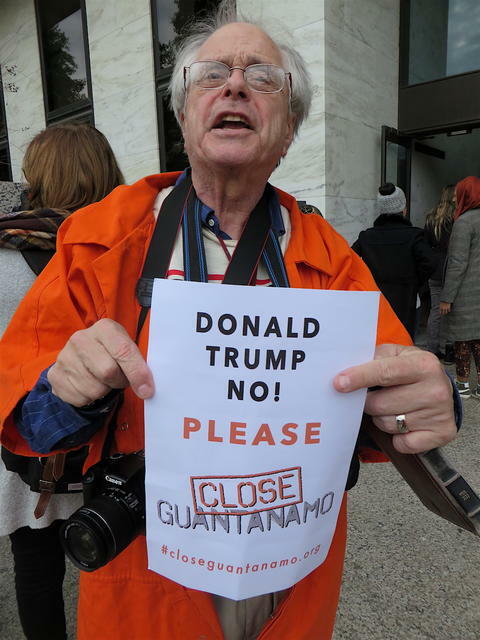 On Day 50 of the Trump presidency, M.J. Park, a member of the Phil Berrigan Reflection Group (named after the prominent peace activist, who died in 2002), calls on Donald Trump to close Guantánamo. She was photographed by Judith Kelly in Accokeek, Maryland. 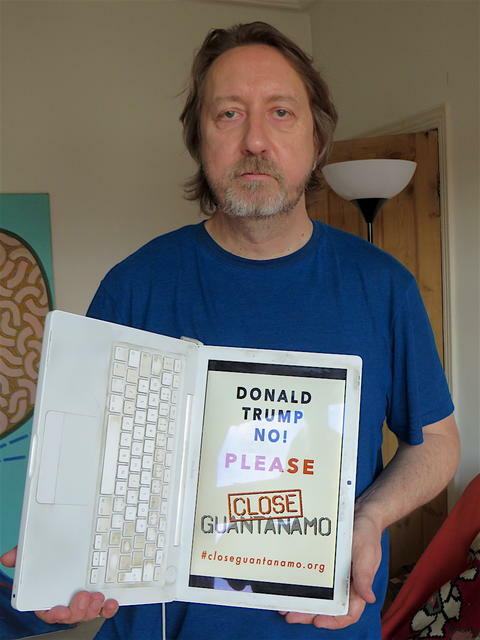 On Day 43 of the Trump presidency, Larry Siems, the editor of “Guantánamo Diary,” by torture victim Mohamedou Ould Slahi, calls on Donald Trump to close Guantánamo, and explains how, rather than being fixated on vengeance like those who want to keep Guantánamo open, Mohamedou has stated, since his repatriation in October 2016, that he is truly a free man, because he has forgiven everyone who was responsible for his torture and abuse. 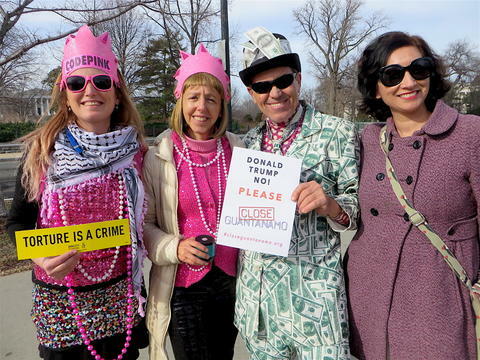 On Day 40 of the Trump presidency, Ariel Gold, Medea Benjamin, Tighe Barry and Nancy Mancias of CODEPINK: Women For Peace urge Donald Trump to close Guantánamo, and not to keep it open and to send new prisoners there, as he has threatened to do. The photo features prominently in the campaign video we released last week, which includes photos of dozens of supporters holding up posters. 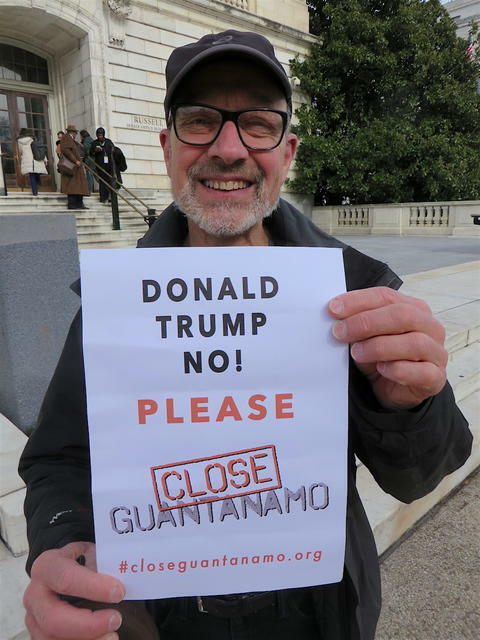 On Day 38 of the Trump presidency, Arlo Varon, from New York, is one of dozens of people holding posters calling for Donald Trump to close Guantánamo, as featured in the new Close Guantánamo campaign video, released last week. 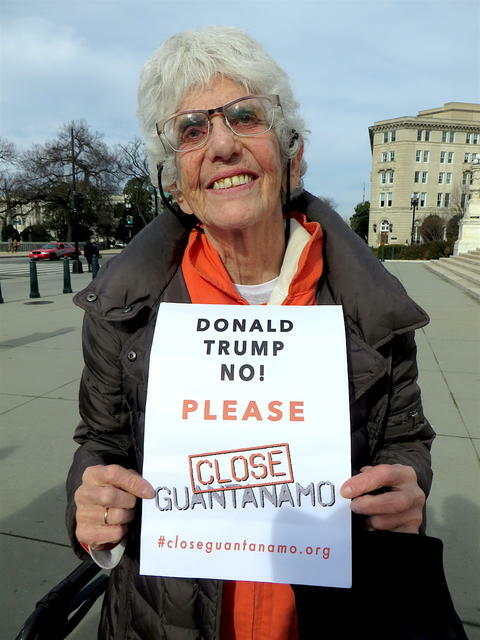 On Day 34 of the Trump presidency, 85-year old Eve Tetaz, a former schoolteacher from Washington, D.C., and a campaigner with Witness Against Torture, calls for Donald Trump to close Guantánamo, and not to keep it open as he has promised to do. Tetaz has been arrested on numerous occasions for protesting, and in a video on Twitter, after she was arrested on the 15th anniversary of the opening of Guantánamo, on Jan. 11 this year, she was asked, "Why was it important for you to get arrested today?" and replied, "Because of my brothers who are still detained in Guantánamo. I want them to know and the world to know, and my government [and] the courts to know that I am in solidarity with them. Torture is wrong. It’s a crime against humanity.” Also check out this Washington Post profile from 2010. 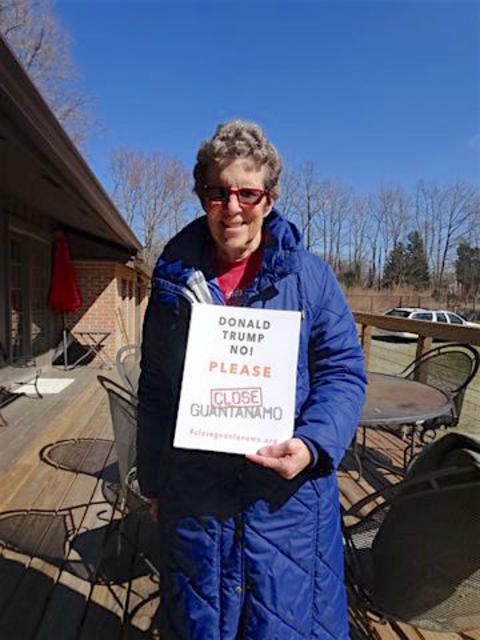 On Day 31 of the Trump presidency, Marie Shebeck of Witness Against Torture says, "I think of the men who are still detained at Guantánamo and what they must think when they see news of Muslims and immigrants being detained at airports and immigration detention centers. Do they recognize the unjust policies that condemned them to life in Guantánamo? Do they think there is still hope for justice? President Trump and Congress - shut down Guantánamo and end your racist, Islamaphobic policies NOW!" 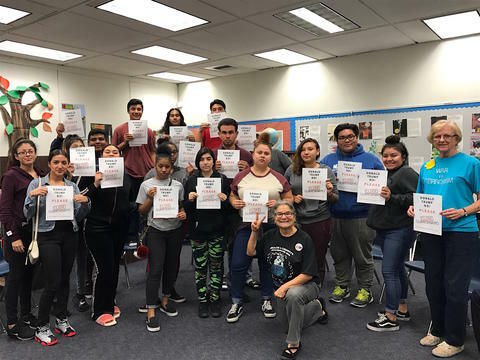 On Day 29 of the Trump presidency, the Peace Club at Tracy High School in Cerritos, California calls on Donald Trump to abandon his plans to keep Guantánamo open, and to send new prisoners there, and to close Guantánamo once and for all. Photo via Dorrine Marshall. 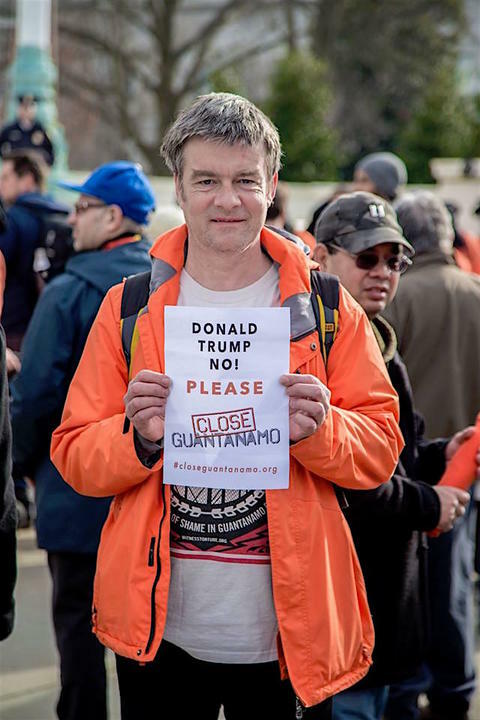 On Day 27 of the Trump presidency, James Yee​, the former Muslim chaplain at Guantánamo, who, in 2003, was held in solitary confinement for 76 days and charged with spying after he was found with a list of prisoners' names, calls on Donald Trump to close Guantánamo​. He says, "Torture and indefinite detention at Guantánamo have eaten away the conscience of America and her people. We have to close it down!" On Day 25 of the Trump presidency, social justice and peace activist Malachy Kilbride says to Donald Trump, "There can be no justice without mercy and truth. Until those who are unjustly held, abused, and tortured in places known and hidden are set free I will not forget my brothers in Guantánamo. Shut down Guantánamo!" 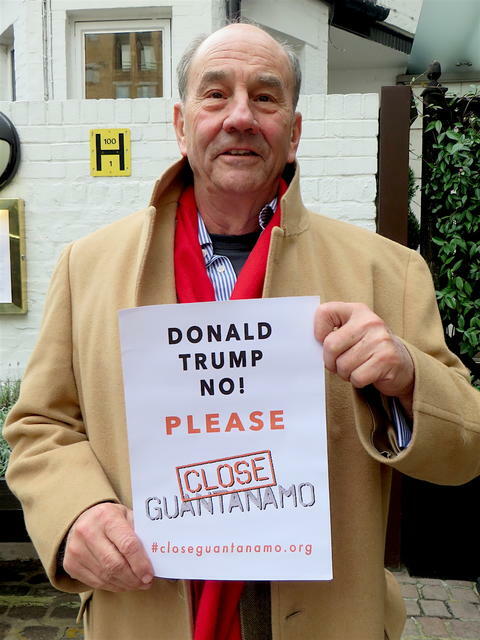 On Day 22 of the Trump presidency, the attorney Tom Wilner, the co-founder of the Close Guantánamo​ campaign, who represented the Guantánamo prisoners in their Supreme Court cases in 2004 and 2008, which established their right to habeas corpus, calls on Donald Trump to close Guantánamo once and for all. "You’re a businessman," Tom says. "Please look at the cost of running Guantánamo. It’s a bad deal for America." At current estimates, it costs at least $11m a year to hold each of the remaining 41 men held at Guantánamo. 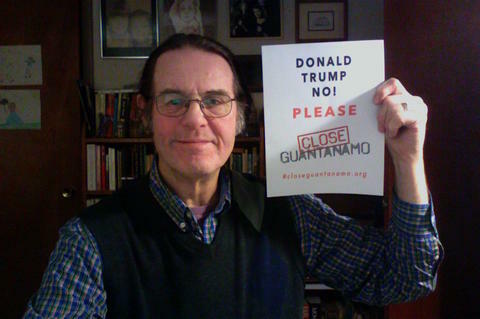 On Day 20 of the Trump presidency, Steve Lane, in Bethesda, Maryland, who was a steadfast supporter of the Countdown to Close Guantánamo in President Obama’s last year in office, says, "President Trump, you have the ability and the opportunity to Make America Great Again by closing the Guantánamo Bay prison camp. That would show the world how we are not afraid of anyone, and how we stand up for our ideals, no matter what the rest of them say or do. No one but you could do that." 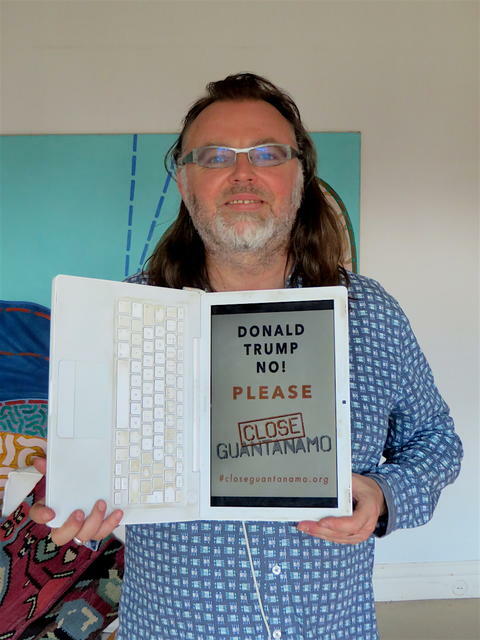 On Day 17 of the Trump presidency, Brooklyn-based blogger The Talking Dog says, "President Trump, The Talking Dog believes that closing Guantánamo is a unique opportunity for you to demonstrate that you truly are an 'outsider' and a change agent, and that you — perhaps uniquely in an 'Only Nixon Could Go to China' kind of way — can do what George W. Bush and Barack Obama tried but could not do, and that is to finally close Guantánamo in a just and lawful way consistent with American values and principles. The world is watching." 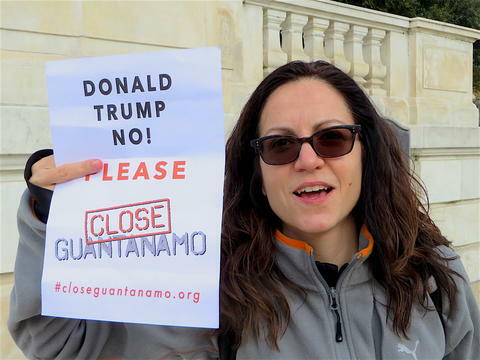 On Day 15 of the Trump presidency, Amy Phillips in Washington, D.C. calls on Donald Trump to close Guantánamo. On Day 12 of the Trump presidency, Louise Devlin, in Glasgow, says, "I attended a Stand Up to Racism demonstration in Glasgow last night, attended by around 1000 people, and took your poster with me. I didn't get a picture at the event but here's me when I got home." 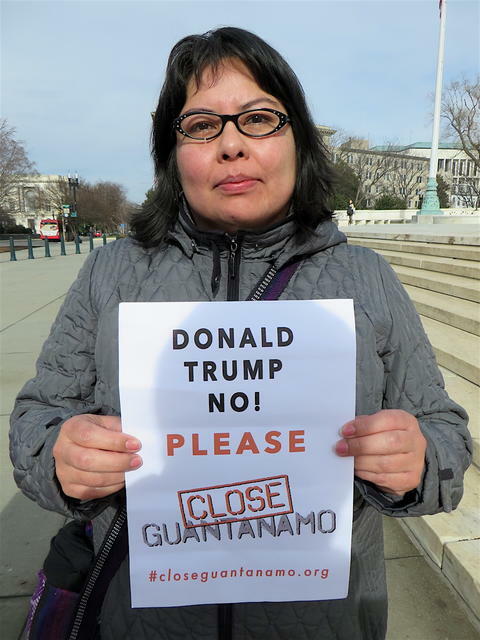 On Day 9 of the Trump presidency, Natalia Rivera Scott from Mexico City, who was a regular supporter of last year's Countdown to Close Guantánamo, now calls for Donald Trump to finish the job, and close Guantánamo once and for all. On Day 8 of the Trump presidency, Debra Sweet, the director of the World Can’t Wait, says, "It was outrageous enough when George W. Bush threw 779 men into a torture camp without legal rights; insult was heaped upon injury when the Obama administration refused to hold any Bush era official accountable for those war crimes. But Trump threatens — and even jokes about — an even worse human rights emergency with his plans to put more people in Guantánamo and waterboard them, and to revive the use of ‘black sites.’ Close the U.S. prison in Guantánamo down now, in the name of humanity." On Day 7 of the Trump presidency, Jeremy Varon of Witness Against Torture says, "President Trump is proving to be the monster we thought he was during the campaign. His talk of bringing back torture and filling Guantánamo anew is barbaric. My hope lies with the good people of the world who want an end to torture." 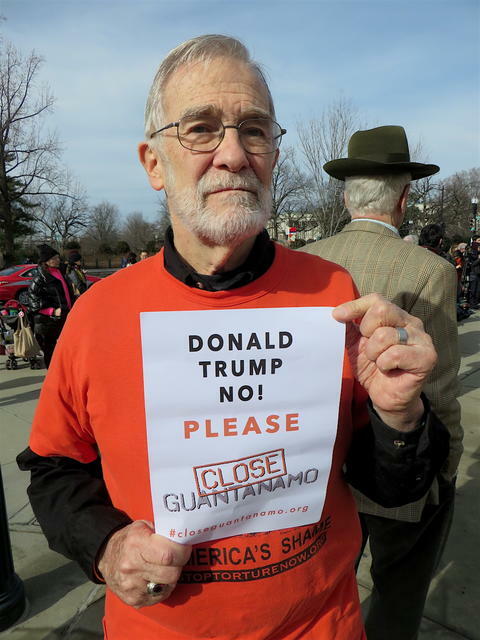 On Day 6 of the Trump presidency, peace campaigner and former CIA analyst Ray McGovern is appalled by Donald Trump's proposals to keep Guantánamo open and to reintroduce torture. 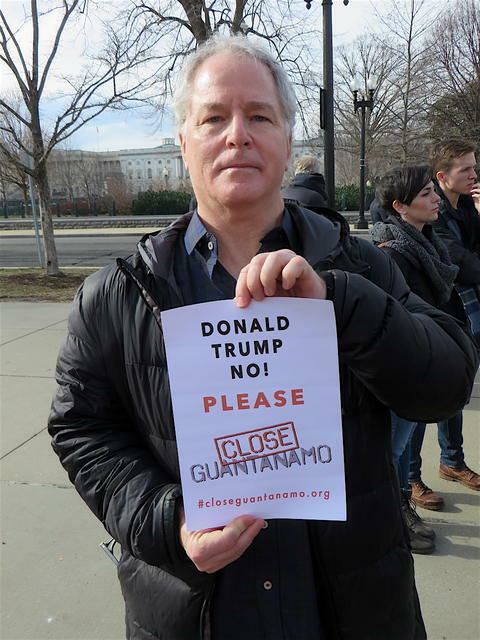 On Day 4 of the Trump presidency, attorney Stephen Truitt calls on Donald Trump to close Guantánamo. With Charles Carpenter, Stephen represents Hani Abdullah (aka Said Nashir), a Yemeni still held at Guantánamo whose ongoing imprisonment has been endorsed by a Periodic Review Board. His case will be reviewed again in another six months -- but not, of course, if Donald Trump scraps the PRBs, which he could do by revoking President Obama's 2011 executive order approving their creation. 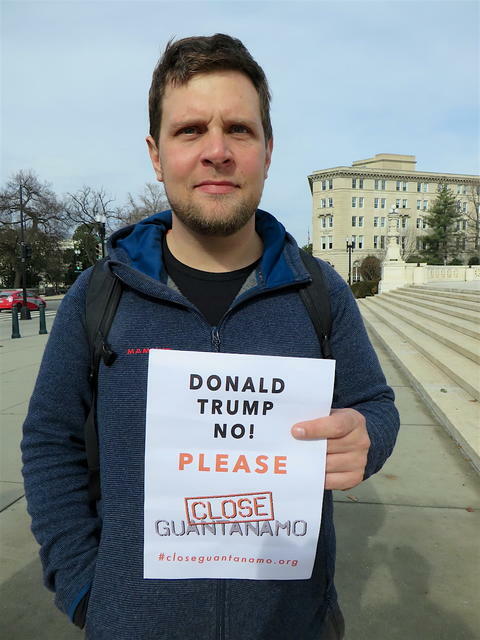 On Day 1 of the Trump presidency, Close Guantánamo co-founder Andy Worthington says, "As the dreaded moment of Trump's inauguration arrives, let me be the first to ask him to abandon his reckless posturing on Guantánamo, and his disgraceful talk of "load[ing] it up with some bad dudes" and ask him to close it instead. It's insanely expensive, and it ruins America's reputation around the world. I also ask for him to honor the status of those prisoners still held who have been approved for release (5 of the 41 men still held), and also to continue with the Periodic Review Boards, which, since 2013, have approved 38 out of 64 men who were previously -- and erroneously -- considered "too dangerous to release."